Jerry Rice was born in Starkville, Mississippi on October 13, 1962 to a bricklayer who employed Jerry at a young age. Rice claims laboring under the hot southern sun those early years strengthened his hand-eye coordination, as he caught bricks tossed up to him on scaffolding two at a time by his siblings, and taught him the meaning of hard work—a lesson that would surely find expression throughout Rice’s career. Surprisingly, Rice showed little interest in athletics early on. However, chance, and a little rebellion, would place Rice on his high school’s football team as a receiver during his sophomore year. In his autobiography, Rice describes sprinting away from his principal after he caught Rice playing hooky. Needing to reprimand the truant yet astounded by the young man’s speed, the principal demanded Rice play football. While playing football is certainly punishing, testing every muscle and bone in the athlete’s body, Rice’s “punishment” would prove beneficial as he quickly adapted to the game and became an All-State player. Nicknamed “World” by his college teammates because he could catch anything in the world, Jerry Rice, his career, shows that winning comes from taking everything the world throws at you. The collective experiences and opportunities that are revealed through time and circumstance should be seized firmly in your fingertips like Rice caught his passes. For some, manipulating experience and circumstance into success will come easily, just by luck. For others working with steeled raw materials, the process of building success will require more. More energy. More time. More loss. But Rice competed and came out on top against men just as tall or taller, just as heavy or heavier, men able to lift bigger weights in the gym or run faster on the track. While height, weight, strength, and speed are important indicators of a player’s ability on the field, they can deceive. In the game, just as in business, individuals cultivate excellence when they have a tenacious love for what they do. Consequently, they practice feverishly until their skills are well-honed, and they view the world from the lens of an athlete, constantly pondering new ways to improve their game. Their endurance is not confined to the boundary lines on the field; rather they continue training while others are showering, they are running through plays in their minds when others have gone to sleep, they are letting seep into every facet of their lives their passion. In a high-pressure situation you will shine because you have a vast reservoir of experience gained from practice to draw from. Not because you have the best connections, the most money, or the fastest return on an investment. We can see evidence that the seeds of Rice’s adult success were planted in his youth. Laboring alongside his father and siblings, chasing horses, as well as frequently running the expanse of a long dirt road near his childhood home—these events accumulated and resulted in the impressively nimble boy that caught the eye of a high school principal. In school, in work, and in starting your own business—in every aspect of your life—motivate yourself to squeeze every ounce of knowledge and value out of the experience. Reflect on the qualities of excel-lence you hold or are cultivating. Did they germinate from an early experience that at the time did not seem worthwhile or particularly foundational? When Jerry Rice was catching bricks, there was no way for him to know that several years later he would be catching crucial passes from Joe Montana in Super Bowl XXIII. Still, he repeatedly snatched bricks out of the air, improving his hand-eye-coordination. When the long-term benefit is too distant to comprehend or the goal obscured by an emotional fog that has not yet dissipated, bear in mind we create meaning and no experience should be discarded as worthless. His work ethic and the self-discipline he displayed helped Rice rack up impressive statistics. Aside from the sheer number of records he holds, his individual records far surpass those of his counterparts holding second place. There is no doubt that mid-way through his career Rice could have left the NFL with an already impressive record. When the 49ers wanted to pay him $1 million to retire, Rice could have hung up his cleats with pride and honor. After taking the Oakland Raiders to the Super Bowl, Rice could have called it quits. But he did no such thing. He kept with the game he loves and played with the same youthful exuberance that he carried onto the field decades back. But for the decision of coaches and team management to bench Jerry Rice, he may have stayed in the game well into his advanced years. Could you imagine a geriatric and decrepit Jerry Rice leaping into the air to catch a pass then running past young athletes without a hope of tackling him? In all seriousness, Rice was in top physical form up to his retirement. The key to his success in the record books stems from his never being complacent. He resisted complacency as if it were the plague. In your own efforts to rack up impressive numbers in customers served, partnerships, and investment interest, remember that greatness is not an expectation, it is a state of being, an attitude. We learn from the nineteenth century German philosopher Friedrich Nietzsche (you know, the guy that authored the now-famous aphorism, “Was mich nicht umbringt, macht mich stärker”*) that perspective is everything. What is “good” can be harmful, and what is “bad” can be beneficial—depending on the perspective one takes. Stress, fear, and the emotional states we often try to avoid or bury do not need to destroy. They can be constructive when we use our freedom to create meaning and value to make it so. Every time Jerry Rice stepped onto the field, he maintained a sense of fear, but he did not let that feeling cripple him. He understood the benefit of having a perspective most valuable to his self. When he ran, it was as if he was running for his life. In your business you will likely encounter stressful situations that prompt fear. Instead of spiraling down an abyss of self-defeat, build upon those feelings to push past your limits as if your life depended on it. Remove the culturally prescribed view of so called “negative emotions” from the worldview that you are creating and funnel your energy, whether brought on by fear or love, into re-envisioning your product, motivating your staff, or cornering the market. 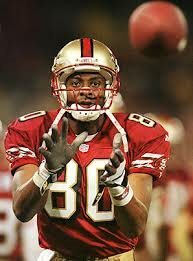 When Jerry Rice was playing football in high school and even through to his career with the NFL, he had plenty of opportunities to cut corners and call it a day because he was worn out. As part of his high school’s conditioning routine, he and his fellow teammates were regularly tasked with running a series of twenty sprints in full gear. On more than one occasion Rice could have slipped away unnoticed. In fact, the thought did cross his mind at least once, when, after having finished eleven repetitions and feeling fatigue set in, he thought he could pull a fast one on the coaches and hit the showers early. Not a terrible offence: he had done most of what was expected and he was exhausted. After all, a mere nine sprints would not have made a measurable difference in the expansive football career of Jerry Rice, right? Wrong. Rice knew then that quitting because he could get away with it or because he felt beat would foster an attitude that accepts defeat. He collected himself and finished the training routine. In the long-term, the difference between a good player and a great player is nine sprints. In your life, the attitude you have in approaching various individual tasks and obstacles, minute and momentous, may have a cumulative effect on your future endeavors overall. Do you hit the showers before you hit the wall? Or do you tear down the wall and finish the course? Choose those modes of thought and action that contribute to your development as a resolute and committed entrepreneur. When asked in an interview about what makes some players shine in high pressure situations and others falter, Jerry Rice responded, “It’s your heart.” Literally, having a healthy heart is very important to personal well-being. But what he meant was something other than the muscular, blood-pumping organ. He meant character, diligence, and determination. He meant the heart to exceed expectations, not because of what others might think of you, but because it was simply the virtuous thing to do. As a businessperson you should have the type of character that sets you apart from the status quo: make ethical decisions regardless of their profitability. You should be diligent in your pursuit to improve yourself and, in turn, your company. You should have the determination to see your goals to their completion. Also, and in all seriousness, take care of your heart (the muscular, blood-pumping organ), because no amount of character, diligence, or determination in business will save you from cardiac arrest. Intuition: we all have it. It is that fuzzy feeling that informs us of when to move forward and warns us of when to hold back. After the lackluster start of his rookie season Jerry Rice began to trust his instincts instead of over analyzing plays and because of this became the 1987 Rookie of the Year. As part of a television show, scientists used tactile sensors attached to then-retired Rice’s hands to analyze the pressure points involved in receiving a pass. Well-known for how he would catch a football—using just the tips of his fingers and sometimes with just one hand—the experiment validated what he instinctually had been doing all along. Virtually all the pressure in his catch is from his fingertips; thus, he can have a firm grip on the ball and avoid having it ricochet off of his palms for a fumble. In operating your business, pay attention to your initial response to a situation. Keep track of when following your intuition has paid off and when it has failed. Avoid making the same mistakes twice. I am sure if his natural method of catching the ball caused more fumbles than it did touchdowns, Rice would have analyzed it, scrapped it, and worked out a better one. Have the same approach. Challenge your instincts to ensure they are beneficial for a given situation and trust them whenever they are useful.